Chorus of Mushrooms is a beautifully written, poetic book that revels in the wonder and majesty of language while being fundamentally about silences. Hiromi Goto examines the multiplicity of silencings that occur in our world – the racialised, ageist, sexist structures that are created in our society to de-voice certain people. Goto examines the way that language shapes and creates us and the way that it can also be used to contain and control us. 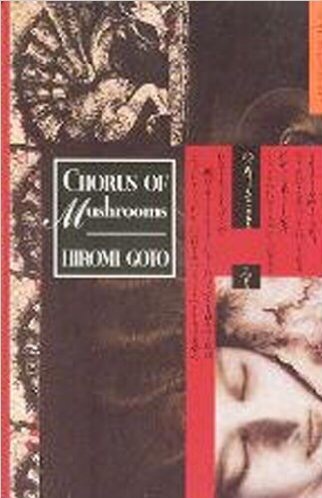 Chorus of Mushrooms is about an elderly woman who keeps talking while no one listens. She tries to assert her voice into a household that has forgotten how to speak Japanese, trying to teach while being fundamentally ignored. In order to conform, her daughter and son in law began speaking English in the home as much as possible, eventually losing those linguistic roots that tied the family together. When they also have a daughter, she wants to connect to her linguistic heritage but ends up discovering that while she didn’t officially learn Japanese, she and her grandmother speak an unspoken, inter-generational language that allows both to feel connected in a family environment that seems to isolate them. Goto expresses the importance of language as a vehicle for story-telling as well as a vehicle for announcing one’s presence. Despite the attempts to ignore the voices of the aged and the culturally marginalised, Obachan, the elderly woman, speaks back, announcing herself to the silence imposed around her. She reminds others of her presence even when they choose not to listen. She creates a world from words. This entry was posted in Fiction Book Reviews and tagged ageing, Hiromi Goto, intergenerational, Japanese, language, resisting silence, reviews.